More work on the remastered Ajax. Finished off the majority of the re-detailing. Played around with a few ideas for the shuttle bays but eventually came back to having them at the rear of the saucer - I have made the doors a little more obvious and detailed them as well. 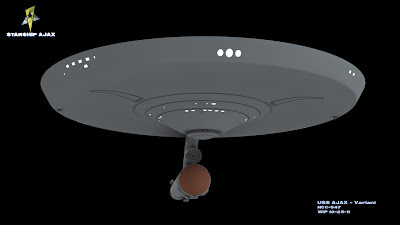 Over at TrekBBS there has been a discussion with regards to the deflector dish placement on the Saladin class. 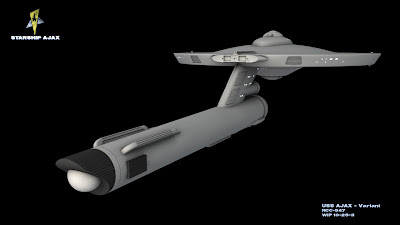 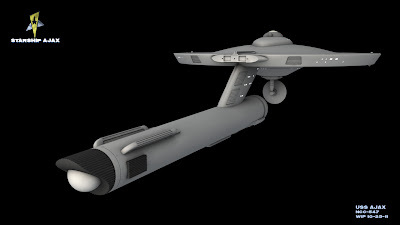 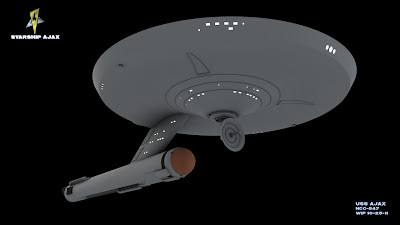 Some argue that the protruding dish is unsightly while others point out that it blocks the bussard collector on the warp nacelle which could impair its efficiency. 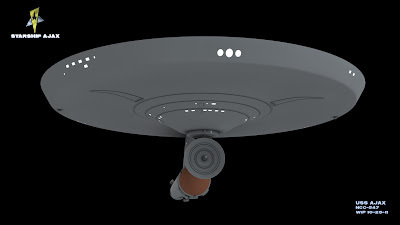 One other writer pointed out that when viewing the orbital test of the Ajax posted earlier, the way the dish obscured the nacelle made it look as if the Ajax consisted of only a primary hull. 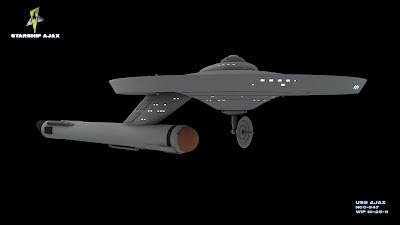 Some of the classic viewing angles for the Enterprise may prove problematic when applied to the Ajax, it seems. Checking through my reference library I came across a variant for the Saladin which relocates the dish to a mini deflector assembly on the neck.